As a Christmas lover, each year I look forward to this remarkable season. There is just something magical about the lights, the spirit, and the people during Christmas time. 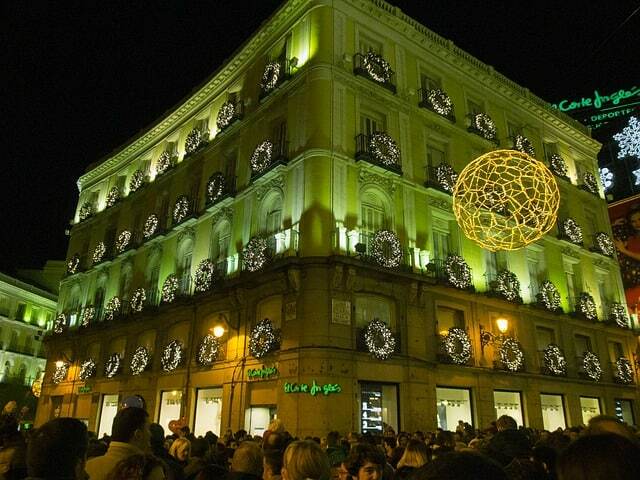 While I’ve often spent Christmas in my dear New York City, where I have lived for the last 16 years of my life (I was born there, but not raised there), the past three years I’ve celebrated Christmas in some other must see places in Europe including Berlin, Germany, Salzburg, Austria and Madrid, Spain. 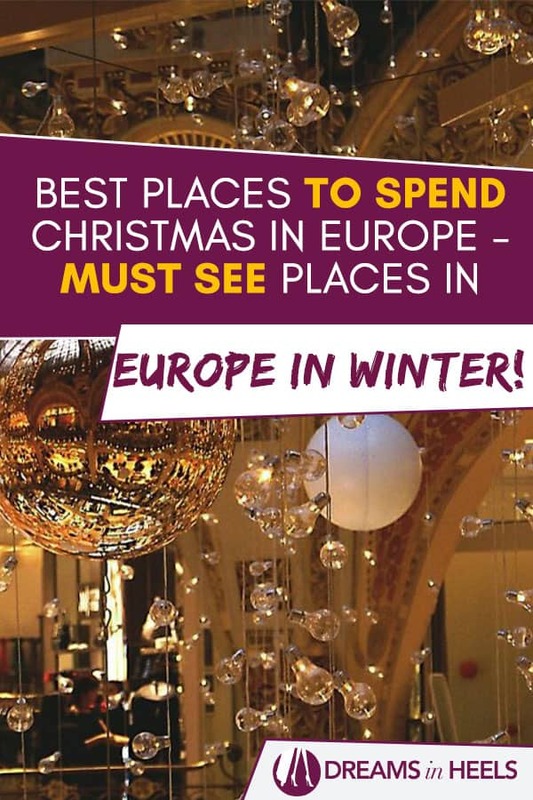 This is the reason I decided to ask other world travelers (travel bloggers to be specific) to share with me “The Best places to spend Christmas in Europe.” Read on to find out why these are the best places to celebrate the holidays in Europe! 1 What to pack for your winter holiday in Europe? What to pack for your winter holiday in Europe? A warm coat – Especially for the evening hours! A nice thick scarf or maybe even two – Scarves can serve many purposes, such as accessorizing your outfits, keeping your head, neck and chest warm and for using as a sarong with a dress. Sweaters – I prefer to have a mix between the button down ones to put over my clothes or ones with turtle necks to wear with a pair of jeans. Casual Loose T-shirt Dress – They are comfortable and easy to wear with leggings and boots. Base layers – tops, lighter sweaters, tights or leggings, thermals, etc…wearing these under your clothes can make all of the difference; and if it gets warmer, you can always remove a layer or two. A hat – It totally makes a difference when it gets really cold. Believe it or not, it really helps to keep your body warm when you cover your head. Or if you do not like hats, maybe bring earmuffs, wear a knit headband or consider wearing a hair wrap (great way to look stylish too). Gloves – Important to keep your hands warm. Always pack a nice dress or several. You never know how your plans can change in NYC. New York can be unpredictable and last minute opportunities may land right in your lap. You might end up walking a red carpet or invited to a random event. You just never know so better to be prepared. A swimsuit – Believe or not, it can come handy if you are staying at a hotel with an indoor pool, or spa. Lip balm or a small vaseline – to keep your lips from drying and peeling due to the cooler temperatures. Sunscreen – Always needed to protect your skin, year round. We spent Christmas Day at the Viennese Christmas Market in front of the Vienna Rathaus. 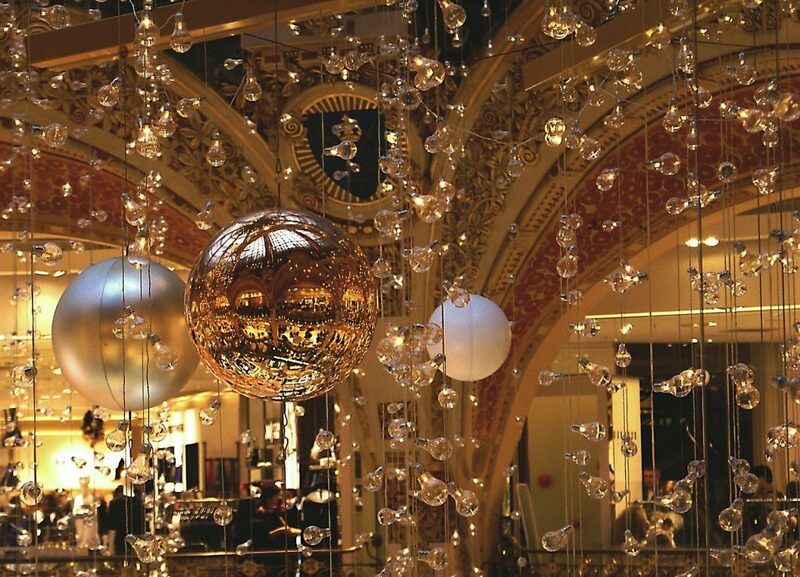 It was the perfect way to finish our European Christmas experience with its festive décor and fun atmosphere. We showed up hungry and were not disappointed as a stand serving enormous baked potatoes topped with different cheeses, meats, and vegetables filled us right up and there were plenty of stalls selling a variety of sweets for dessert. We hit several of the glühwein stands to keep warm and sample as many of the flavors as possible. After we had spent a couple hours browsing the stands and buying Christmas ornaments and other décor, we hit the skating rink. I’ve been to plenty of open skates over the years, and every single one of them has involved skating in circles around a rink until you get bored. The Vienna Christmas Market’s skating area was so much more fun. There were twisting, turning pathways of ice looping around each other and even encircling a giant snowglobe that contained a replica of the beautiful Rathaus that overlooked the whole market. It was easily one of the best Christmases I’ve had! A few years ago my parents moved to the Algarve in the South of Portugal, and I was able to celebrate Christmas in the Algarve. Christmas in Portugal, and in particular in the Algarve, is quite a unique experience particularly coming from Ireland where I had grown up. Firstly, there’s the weather. A winter sun break is fantastic, but Christmas in the sunshine does take a bit of getting used to. It’s strange being able to shop for Christmas presents in little more than a t-shirt and fun, but equally strange, having Christmas dinner outside. I love it but now having celebrated Christmas in the Algarve with friends and family from back home, I realize it’s not for everyone. It’s also fun trying having traditional Portuguese dishes for Christmas dinner instead of turkey. In Portugal, typical dishes include bacalhau (usually Bacalhãu de Consoada) or octopus. Desserts and sweet dishes are a big focus on the meal, particularly rabanadas, sonhos, and azevias do grão e amendõa. There’s also lampreia de natal, which is a lamprey fish made entirely from egg yolks. It’s an incredibly bizarre dish that’s apparently made for children, although Portuguese adults tend to love it just as much. 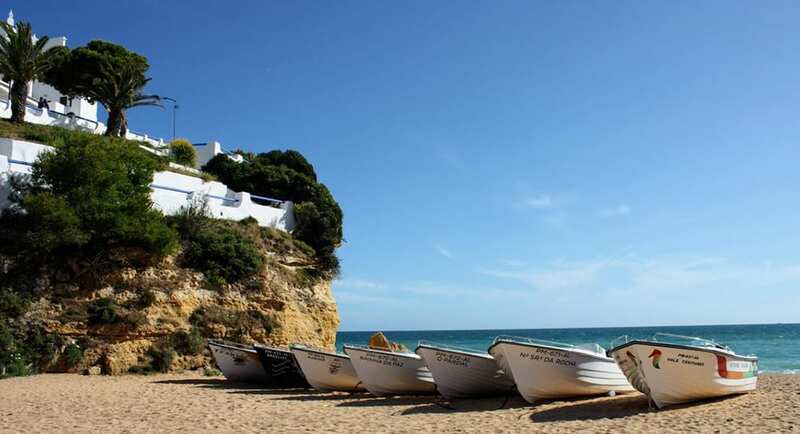 The Algarve usually has cheap flights during the winter months so, if you’re looking for somewhere different to spend Christmas, consider flying out and spending it there. Lyon is one of the best places we’ve celebrated Christmas in Europe. Sebastien is originally from there so we celebrated with his family. A visit to Lyon is in any case always a treat because it is famous for being the gourmet capital of France, with some of the best restaurants (called “bouchons” in Lyon) in the country. It also has some of the best meats, wines and cheeses we’ve ever tried. In addition, it is super easy getting from the airport to Lyon centre. 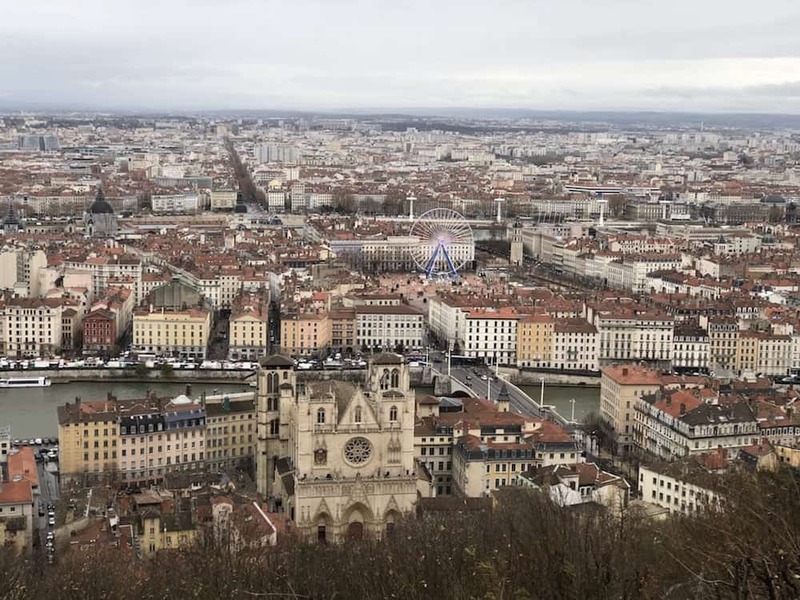 A visit to Lyon during Christmas time is even more of a treat. Lyon itself is a really pretty city to explore. The Old Town (called Vieux Lyon) is full of really cute narrow cobblestone streets and lots of bouchons. The Presqu’île neighbourhood of Lyon is always alive with atmosphere due to the large student population with many cafes, bars and restaurants. The main highlight of Lyon, which it is most famous for is the “Fête des Lumières” festival that takes places during Christmas time in December. This is a 4-day festival, which is a celebration to the Virgin Mary who watched over the city and spared the Lyonnais from a serious plague in 1643. Therefore, this festival honours her and gives thanks to Marie (“Merci Marie”) for saving the city. This was done by placing a candle outside every window – a tradition which the residents still do today, which creates quite an extraordinary and warm atmosphere across the entire city. The Light Festival also has really dramatic light displays each evening on the main monuments. 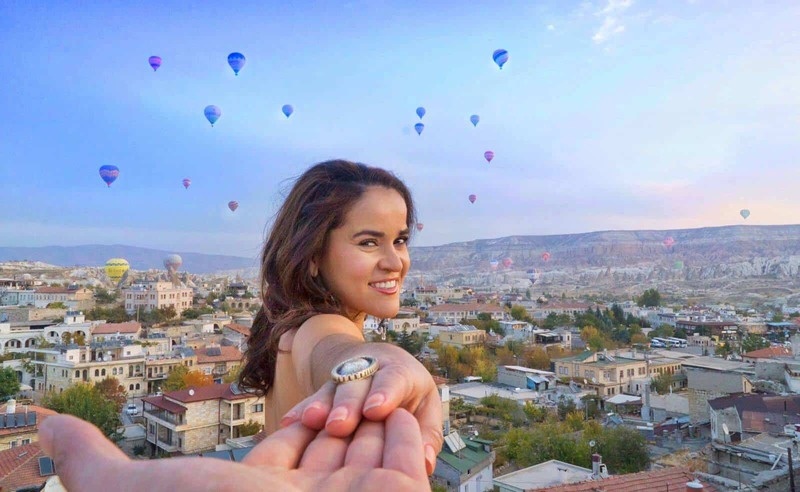 This is a nod to the Lumière Brothers, who are from Lyon and are recognized as pioneers in the movie industry for creating the first motion picture. Montreux, Switzerland is perfect for anyone wanting some Christmas spirit. Montreux doesn’t just have a pretty location on the banks of Lake Geneva, but also has a Christmas festival, Montreux Noel, in the month leading up to this date. The centerpiece is their Christmas market. Located along the banks of the lake, this market seems to go on forever. There are many gifts as well as great food and drinks and carols playing through speakers. 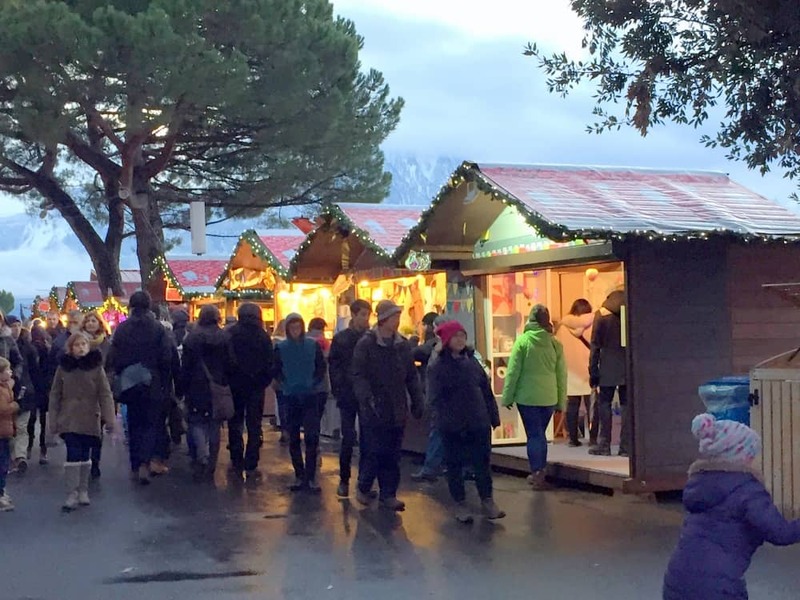 This market takes things a step further with an Elves Village with activities to learn and several times a night, Santa Claus himself flies over Lake Geneva in his sleigh. It can sound tacky but it’s well executed and adds to the experience. There are also light shows nearby. In addition to this, UNESCO listed Chillon Castle has medieval Christmas celebrations with much to learn about how Christmas used to be. There is also the option to take a cog train up Rochers-de-Naye. At 2,000 metres above sea level, there are great views over the lake and surroundings as well as from the train on the way up. There is also a good chance that there will be enough snow to ski. During the festival, the big red man himself is up here in his “house” and you can meet him and take a photo. With all of this, Montreux is the best place to celebrate Christmas in Europe. 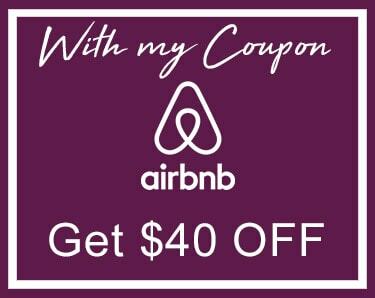 Recommended: I love Switzerland, experience 4 countries and cultures all in one place! Christmas in Budapest is a lovely experience. There are several Christmas markets in the capital city. The biggest and most popular is at Vörösmarty Square. It is not only one of the cutest, but also one of the most affordable markets in Europe. It has several stalls selling handcrafted products, which are perfect as gifts for your loved ones. You can also get to know the Hungarian culture a bit through the productions they have on the stage. There is often live music and traditional folklore dance. If you want to try some tasty Hungarian dishes the market is the perfect place to do it. Lángos is a deep fried bread topped with garlic, sour cream and grated cheese. It is a popular street food. Chimney cake is perfect for dessert. It got the name for its shape. The crunchy, sugar-baked pastry resembles a chimney. It can be sprinkled with cinnamon, sugar, coconut or cocoa powder. Budapest Basilica Christmas Market is also worth a visit. It has a small ice rink set up for the Christmas season. Budapest is also famous for its thermal baths. It is a great feeling to sit outside and relax in the hot water. Rudas Baths even have a rooftop jacuzzi with a great view to the Danube River. It is a definite must for your winter trip to Budapest. Denmark; I moved there when I was 21 and lived there for two years. Since I left Denmark, I’ve celebrated Christmas in three other countries but my favourite is still Denmark. It’s probably because of the white Christmas or the fact that I was surrounded by people who are not related to me but showed so much love and kindness during a time where I’m used to be around my family. The Danish celebrate Christmas just like most countries. They have gifts under the tree, Christmas dinner, warm hugs over a great wine, and laughter everywhere. However, what I love most about their traditions is when everyone gets together, standing around the Christmas tree, holding each other’s hands, and go dancing and singing. The kids love it and, at the same time, it gives such warm and comfort to everyone in the room. I’m not sure what the dancing around the tree actually means, but it makes me smile every time I remember it and makes me want to be in Denmark for that time of the year. 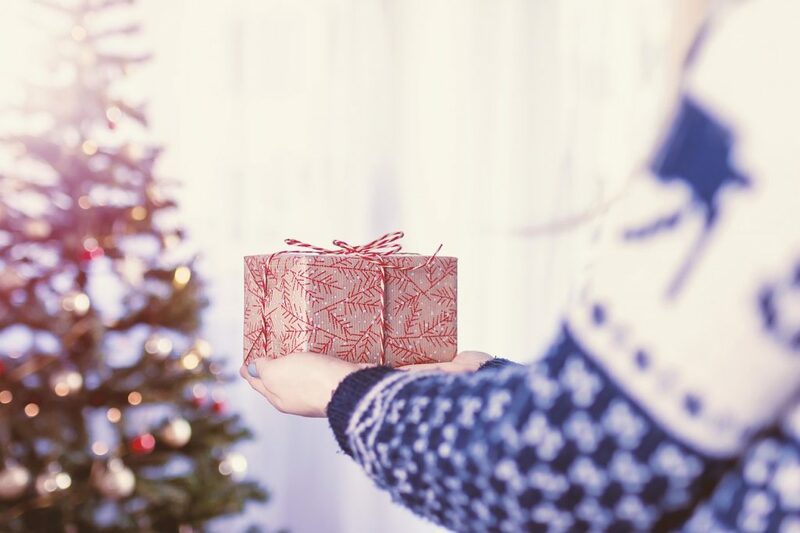 If you are planning to celebrate Christmas outside your home country, reach out to your Danish friend and see if you can join their family – it’s such a fun and memorable experience! Two years ago I spent Christmas on Madeira Island, in Portugal, and I loved it. I cannot wait to be there again, this Christmas season. Madeira, and especially it’s the biggest city- Funchal – is a great place to spend Christmas. Streets, bridges, palm trees, houses are beautifully decorated with Christmas lights. Thanks to its location on the hills, the bay of Funchal looks beautiful and colourful during the holidays. Most of the decorations can be found around the Funchal Marina, in the Jardim Municipal park and on Avenida Arriaga street. 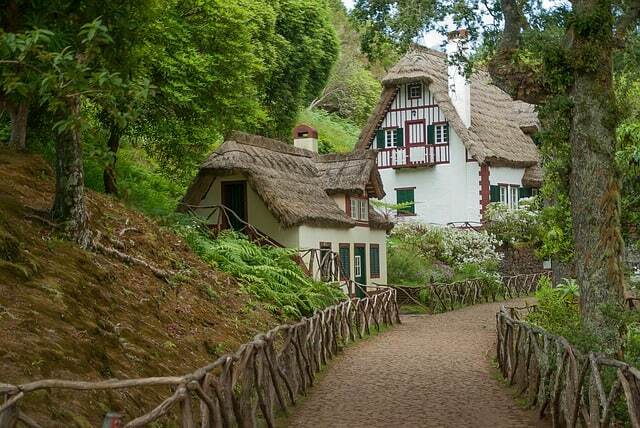 You can find there, for example, a small Christmas Market and Santa Clause’s village, as well as many Christmas Cribs and food stands serving traditional food. Multiple events are held in that period, such as the famous Market Night and a 6-kilometre city run through the beautifully decorated streets. Madeira is simply a perfect mix of good weather and a wonderful Christmas spirit. It is a perfect place for those, who would like to escape the snow and low temperatures, but not the beautiful Christmas decorations, traditions and a great Christmas mood. 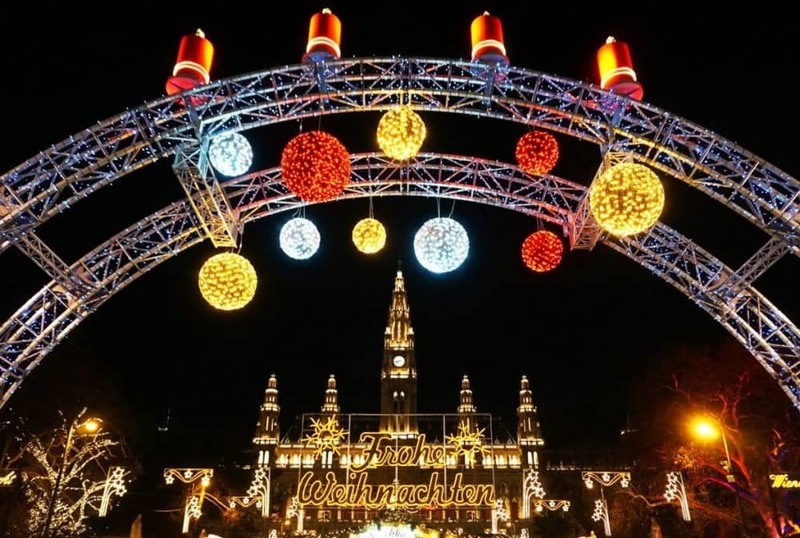 Would you like to know more about Christmas and NYE in Madeira? I wrote a detailed post on my website. Paris is a wonderful city to visit at any time of year. But the French capital is particularly magical at Christmas. In December, the Avenue des Champs-Élysées glows with thousands of twinkling lights, patisseries fill up with festive treats, and glittering ice rinks pop up throughout the city. I love Christmas in Paris so much that I’ve celebrated the holidays there twice. Christmas Day is a rare opportunity to explore Paris’ elegant streets without the crowds. Wander through the tranquil Jardin des Tuileries or Luxembourg gardens, browse the stalls at one of the city’s Christmas markets, or book ahead and take a romantic cruise along the Seine. You could spend a couple of hours in one of the museums that stay open on December 25th, such as Musée de Montmartre. 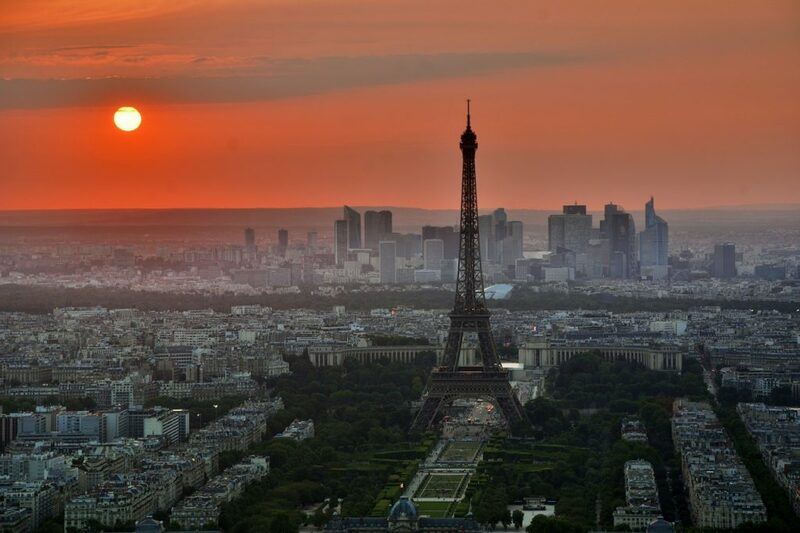 Or climb the Eiffel Tower for sweeping views of Paris. For a special lunch or dinner on Christmas Day, options range from traditional brasseries to Michelin star hotel restaurants. Parisian brassieres often offer all-day festive menus, but you’ll need to reserve a table a few weeks in advance. There are also seasonal concerts in some of the city’s most spectacular churches, including Notre-Dame and Sainte Chapelle, so it’s worth checking ahead for tickets. 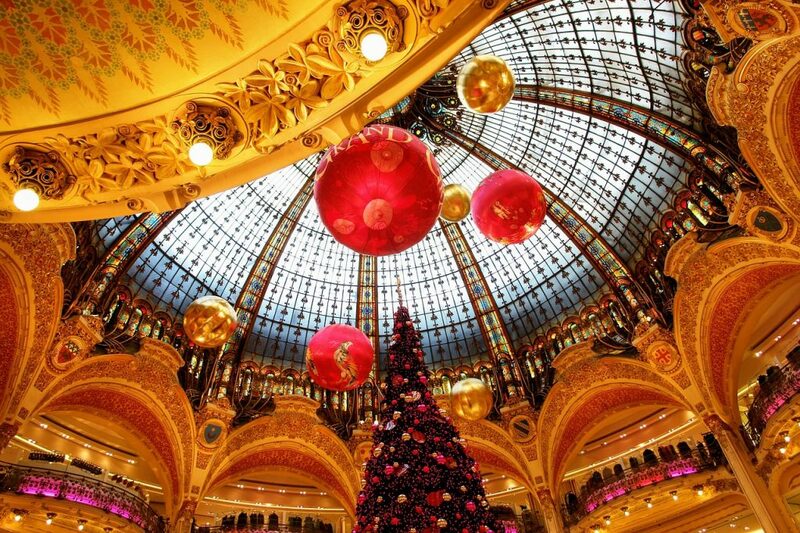 Paris is a city steeped in culture and Christmas time is no exception. One of the best destinations in Europe to celebrate Christmas is the beautiful city of Dordrecht, The Netherlands. Dordrecht is one of the many cities that barely have foreign visitors. The reason? People don’t know that this city exists. 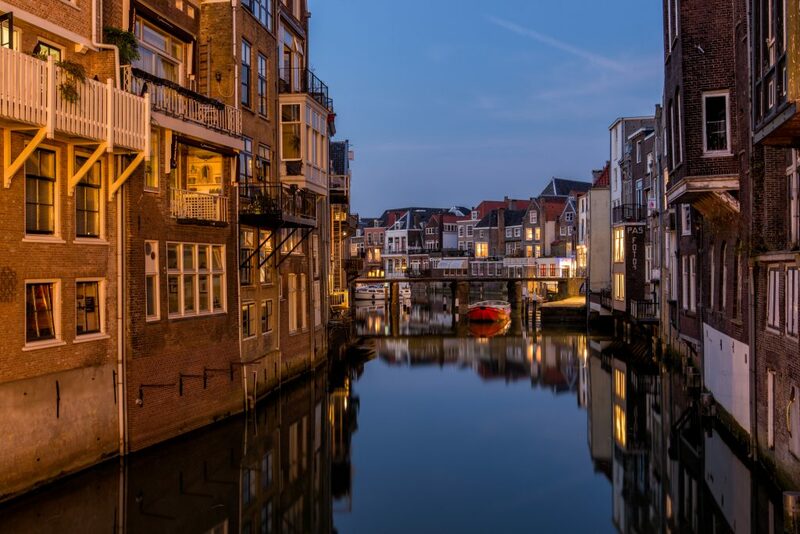 But imagine walking through a cobbled stoned city that is filled with gorgeous canal houses. And although you can find those kinds of cities all throughout The Netherlands, Dordrecht feels different. Maybe it’s the lack of foreign tourists? The cosy atmosphere? The majestic city? Or the lovely people? I think it’s a combination of all of them, but I know one thing makes celebrating Christmas even more special. And that is visiting one of the best restaurants of Dordrecht. The restaurant/hotel Villa Augustus is one of the most special restaurants of Dordrecht. It opens 7 days a week from the early morning until the late evenings. The restaurant of Villa Augustus works with the best, local and organic products. And a lot of their products come from their own kitchen garden. All the vegetables, fruits and herbs go straight towards the kitchen after harvesting. You can walk through the kitchen garden, but there’s more to see. Village Augustus in Dordrecht has a big garden, an orchard, kitchen garden, an Italian garden and much more. The restaurant also has a big garden that you can walk through. Do stay on the paths that walk you through the gardens so you don’t destroy products. I’ve celebrated Christmas in several European cities but one of my all time favorites is Hamburg, Germany. I lived with a German family there for a year in high school and returned a few years later to celebrate a second Christmas with them. In addition to the many things that make for a warm and cozy holiday celebration, e.g., great people, delicious food, and lots of laughter, there are so many things to love about Christmas in Hamburg. Sure, it’s cold and it gets dark early but you’ve also got Christmas markets to explore (and Glühwein to drink), lots of wonderful shops for finding the perfect Christmas gift, the beautiful city lights and holiday decorations, cozy cafes and bars, just to name a few. Germans don’t let cold weather or rain prevent them from spending time outside, so you’ll also find people taking long walks along the Elbe river or in one of the city’s many parks. Both times I was in Hamburg it snowed; one year I joined the public party on the frozen Alster lake in the middle of the city, and another year I went ice skating on a lake near my host family’s house just outside the city, and then sledding on some hiking trails. 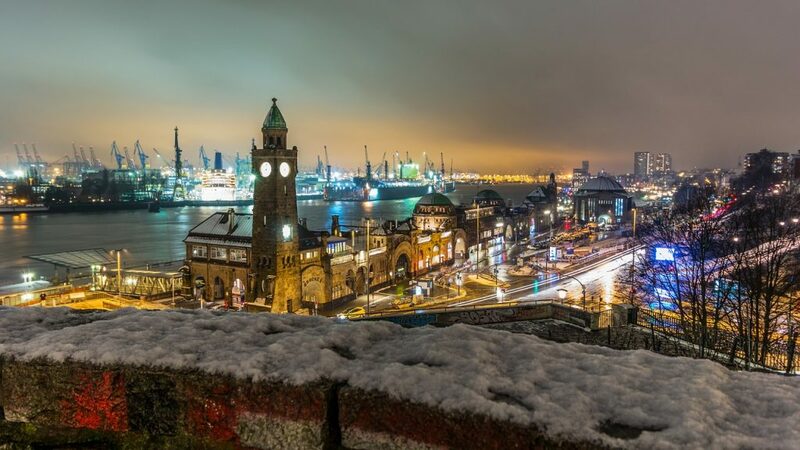 You’ll never be bored in Hamburg, even in the winter! We’ve travelled to many cities in the world for winter holidays, but our favourite place in Europe to celebrate Christmas is definitely Strasbourg. Located in Eastern France but only a few kilometres away from the German border, the capital of Alsace was a German city until the 17th century and again during WWI and WWII. Due to its unique position and history, Strasbourg is thus immersed in both French and German cultures. In terms of gastronomy, this city is a true food paradise! You get the French savour and the German quantity. When Christmas approaches, we love driving down to Strasbourg to feast on a delicious foie gras or escargots, as well as a succulent choucroute, Flammekueche or Baeckeoffe. May it be at Le Gruber, Zuem Strissel, or any other traditional Winstub in Strasbourg, Alsatian specialties are always a delight! However, food is not the only reason why we love celebrating Christmas in Strasbourg. This city also happens to be the home to the largest and oldest Christmas Market in France – and probably of Europe – dating back to 1570. Imagine strolling around more than 300 snow-covered wooden chalets scattered all over the city, while sipping on a cup of mulled wine and watching the charming half-timbered houses lit up with thousands of magical winter lights. As a matter of fact, Strasbourg is not only the capital of Alsace, but also the capital of Christmas! 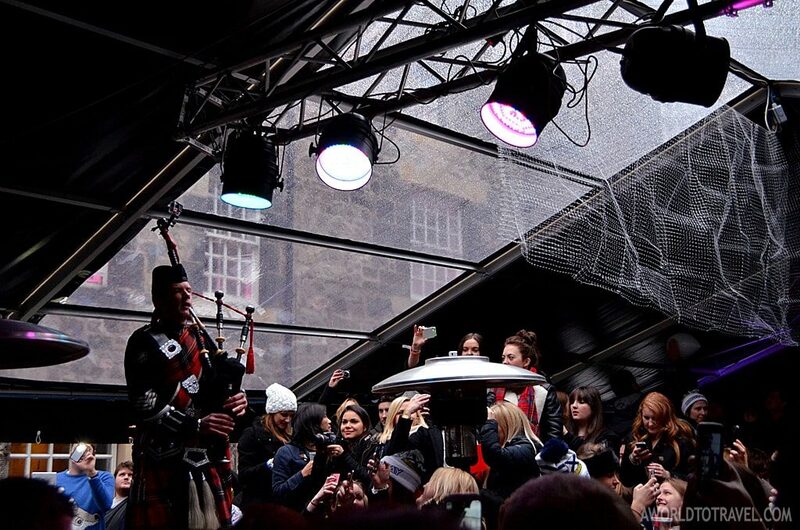 There are many reasons why Edinburgh is an excellent option to spend a different and very fun Christmas. From its Christmas markets that fill the center of the city with color and light, such as East Princess Street Gardens and George Street, and the ice skating rink around the St. Andrew’s Square, the spectacular attractions they are mounted on the occasion of these parties in George Street and surroundings; and the Hogmanay and Loony Dook celebrations during the last days of the year; Edinburgh should be a mandatory stop for all those in love with cold, white and unique Christmas. Our favorite was undoubtedly Hogmanay (the Scottish term for New Year’s Eve), a great street party attended by up to 150,000 people from all over the world and which we had the opportunity to enjoy a few years ago. There are music groups that perform in various stages scattered around the city center and followed by a spectacular display of fireworks under the castle just before midnight. Unforgettable. Malta is an absolutely incredible Christmas destination, especially if you’re looking for something sunny and relatively warm. I’ve always heard the feedback from my friends and relatives that Malta isn’t the best destination for swimming in summer due to the scarcity of beaches on the island and it’s more of a sightseeing destination. That’s why I decided to visit Malta for Christmas back in 2017. And honestly, I was really impressed! I would definitely consider it to be the best destination to spend Christmas! 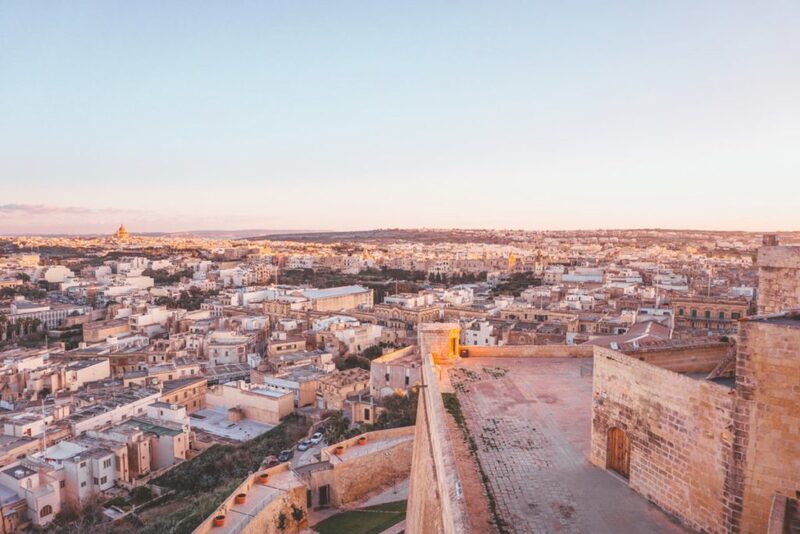 In order to see Malta properly, you would probably need at least 5 full days, so that you can explore the main island, head to Gozo (a day trip from Malta to Gozo) and even hop on a ferry to Camino island to see the famous Blue Lagoon. Also, I would definitely recommend hiring a car, especially offseason, as it’s way easier to get around Malta by car. In Gozo, there are some really amazing places (e.g. caves) that you can’t reach by public transport, so renting a car would be basically the only option. And finally, the weather in Malta in winter is generally relatively warm. It could be rainy/windy, but we had luck with 5 days of sun and about 14-15 degrees Celsius, which is not bad at all (compared to cold and rainy London). One of the best places that I got to celebrate Christmas in Europe was in Salzburg, Austria. As a latina that was living in Linz, Austria, I totally enjoyed the different Christmas traditions of Austrians and, of course, the lovely Christmas Markets. While on the 25th most places are closed in Austria, you can still find the Residenz and Cathedral Square Christmas Market open (it is actually open until December 26th). There are other Christmas Markets as the one at the Mirabell Square, inside the Mirabell Palace (a Unesco World Heritage Site), which is only open until the 24th and closes on that day by 3:00pm. I got to enjoy both markets in Salzburg and to also eat beef goulash with knoedel (bread dumpling). It was just a quick 45 minute car ride from Linz into Salzburg. 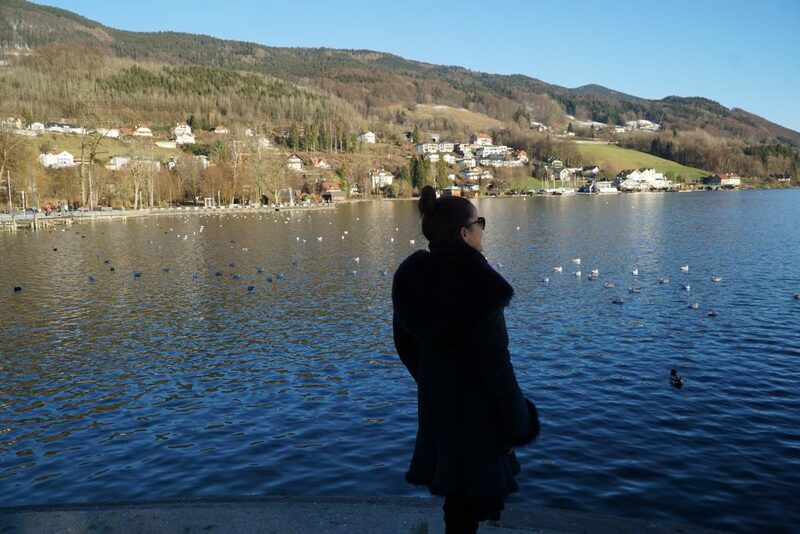 And one of my favorite things was making a pit stop by the lake Mondsee (means Moonsee in English), and enjoyed the picturesque view. Mondsee is on the way to Salzburg from Linz. It is such a beautiful place to just take a moment and take in the views. While in Salzburg, I also got to walk around the Mozart plaza and see Mozart’s birthplace. 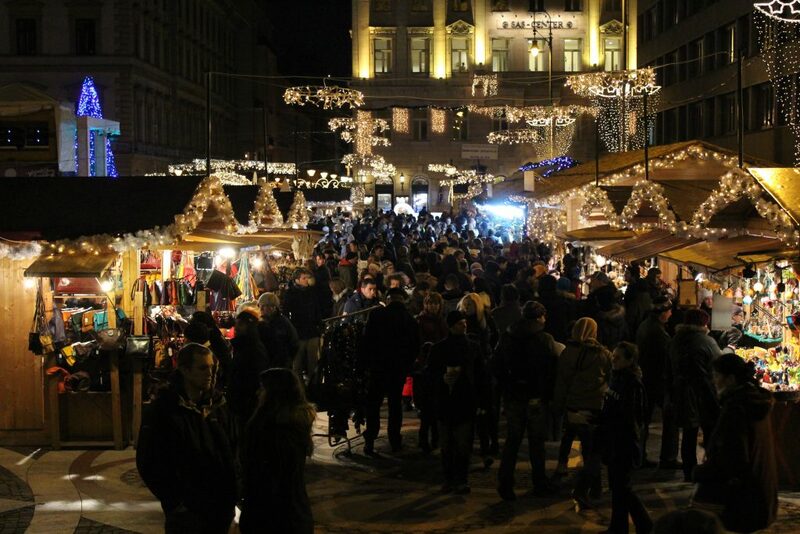 In the Christmas Markets, you can find unique gifts, artisan crafts, traditional Austrian food (such as different kinds of sausages), fish, stuffed chicken, and other appetizers, such as cheese and meat plates, etc. 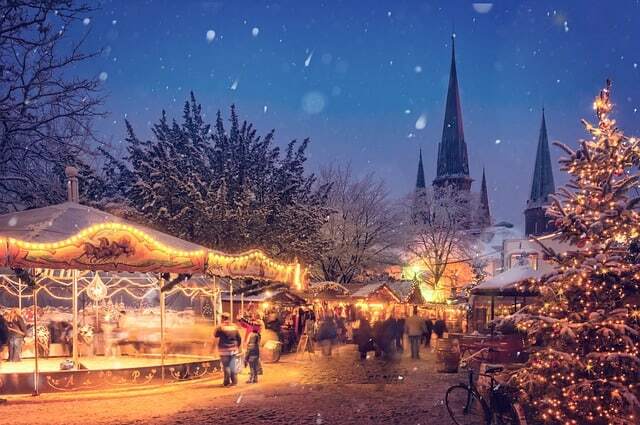 There are also lots of sweets, such as roasted almonds, Christmas cookies, Bauernkrapfen (a fried dough (or for me, sort of like a donut) with jelly or powdered sugar on top), and of course Glühwein (mulled wine) and craft beers for those beer lovers. I also totally love the views from the Hohensalzburg Fortress. There is a Christmas market there as well, but it ends on December 23rd. 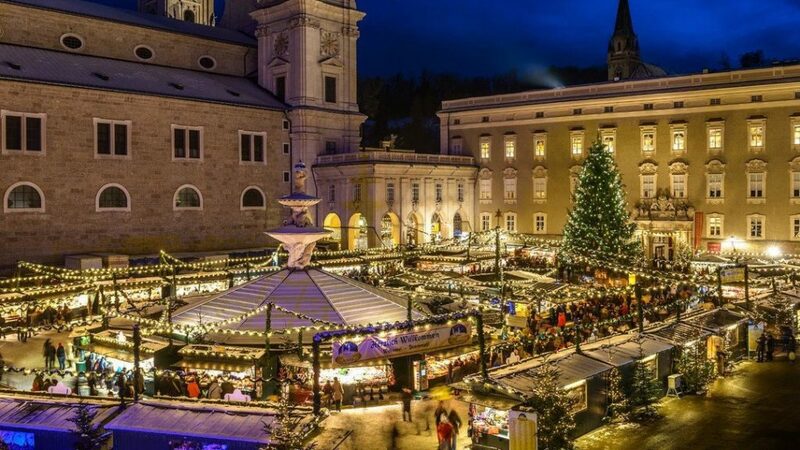 Salzburg is a magical winter holiday destination, especially at Christmas time! Berlin is such a cool, funky and trendy city. I also got to live there for some time and totally love the international community, having met so many digital nomads like myself. I enjoyed so much spending Christmas there because of the feeling of community and my new friends. There are so many expat events, especially potlucks where we each bring dishes from our country to celebrate the holidays. There are also many wonderful Christmas Markets in Berlin. I recommend going with friends so that you can share and try different food and drinks. I got to visit most of them with my ex-roommate and also with other people that I connected with through groups I belonged to in meetup.com (groups for expats, writers, foodies, etc. – you name it!). 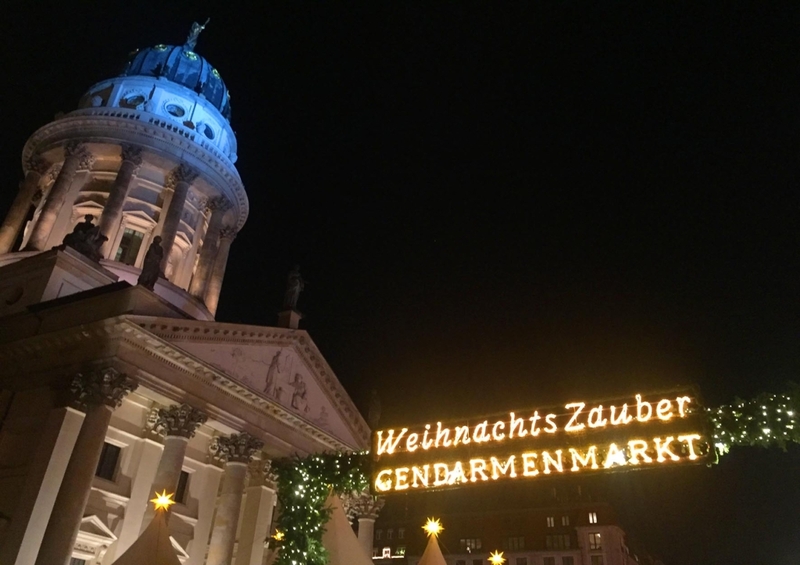 One of my favorite Christmas Markets in Berlin has to be Gendarmenmarkt. It is such a beautiful square, surrounded by amazing architecture. As you look around, you will see the famous Konzerthaus, The Deutscher Dom (German Church), Franzosischer Dom (French Church) and, in the middle of the square, stands a statue of Germany’s renowned poet, Friedrich Schiller. I totally loved how everything looked so lit up and cute when they put up the Christmas Market. It just feels cozy and festive there. I also enjoyed eating all of the German traditional food and, of course, as a wine lover, I loved the Glühwein (mulled wine). Plus, they have some cool personalized gifts, artwork, artisans and amazing local fashion and accessories designers. As a fashionista, I fell in love with so many things; it’s a great place to shop! Christmas is a special time of the year to visit Berlin. 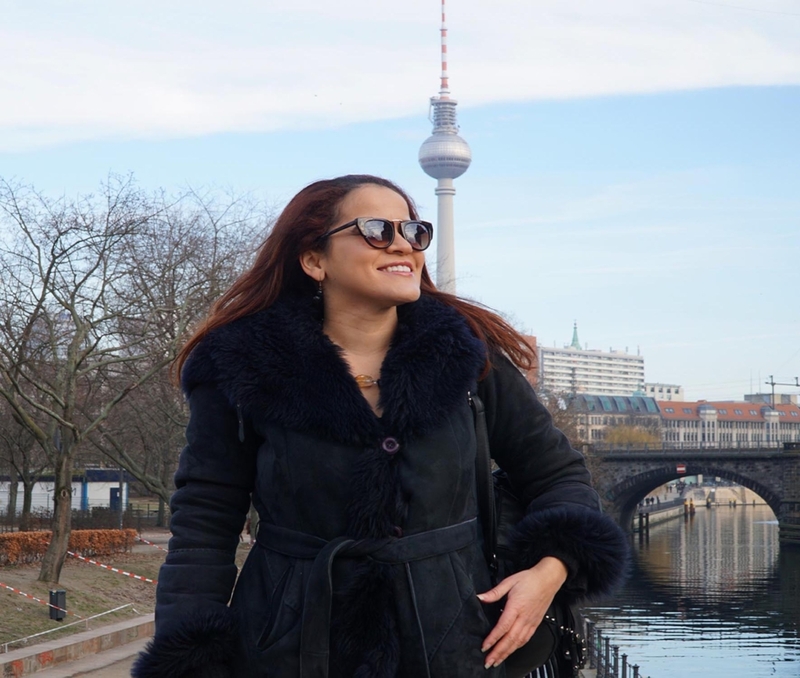 Another Favorite: Berlin Insider Tips: Visiting Berlin, Germany for the first time! 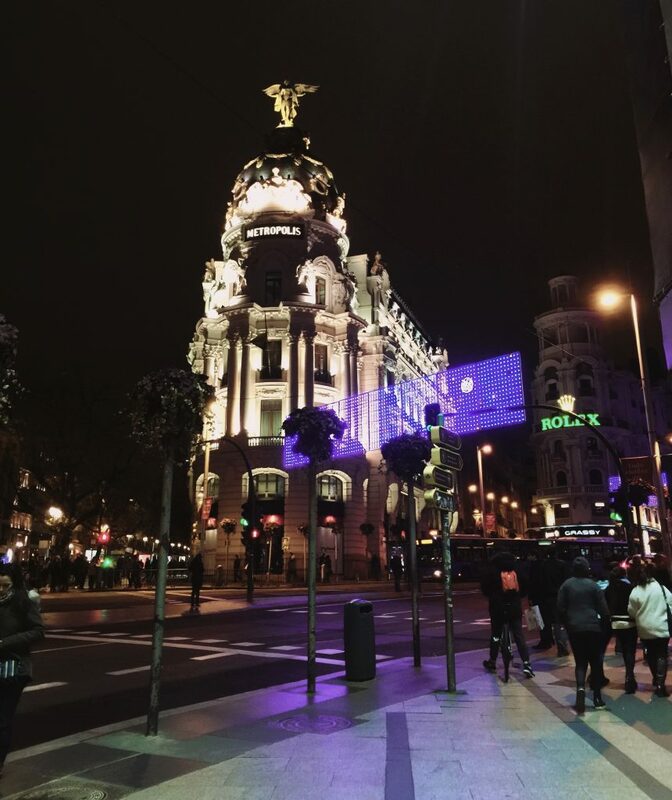 Last year, I got to spend Christmas in Madrid. A great place to be, even though it was quite cold and windy on the 25th and 26th. I had an amazing 24th where I went to Christmas Markets inside Plaza Mayor, went sightseeing around with a local friend and much more. The food in Spain is always awesome. I went for tapas, wine and, of course, started my day with churros with chocolate and amazing coffee. One of the highlights was spending Christmas Eve with the friends of my local friend. They were all from different parts of Latin America and some Spanish as well. 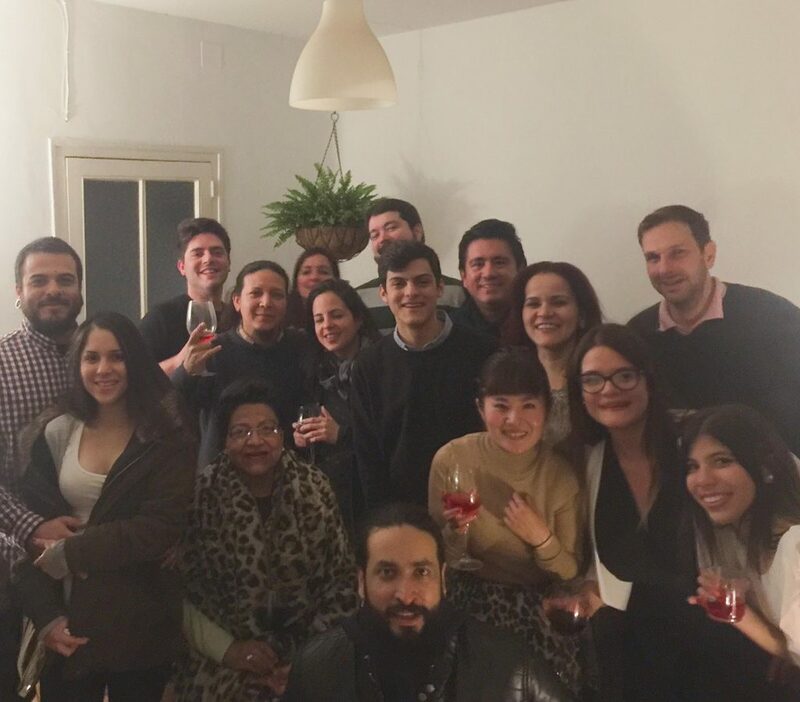 We had a blast with amazing food, latin music, and there’s nothing like the hospitality of Latin American people. As a Latina, sometimes I miss that welcoming spirit. 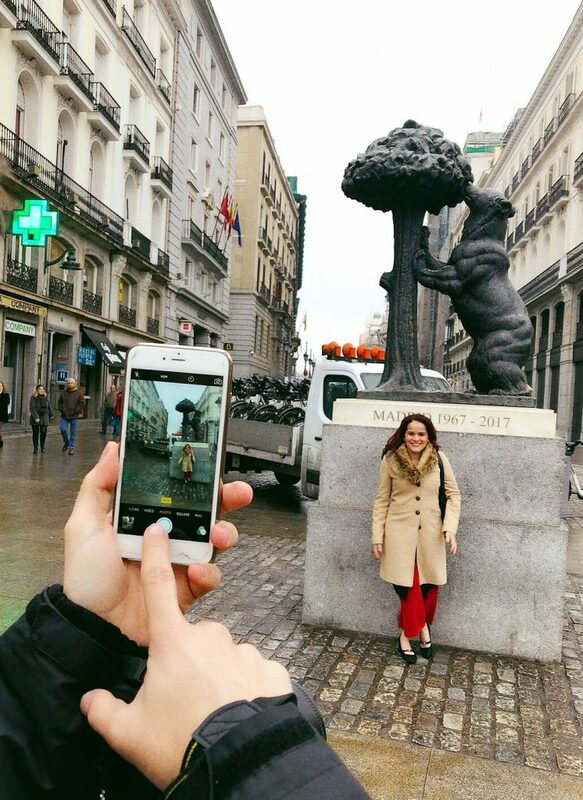 Madrid fulfilled that since it is a very international city as well, especially with people from Spanish speaking countries (my first language). Just like having a little of piece of home, even if only for one evening. Hope that you are feeling inspired! 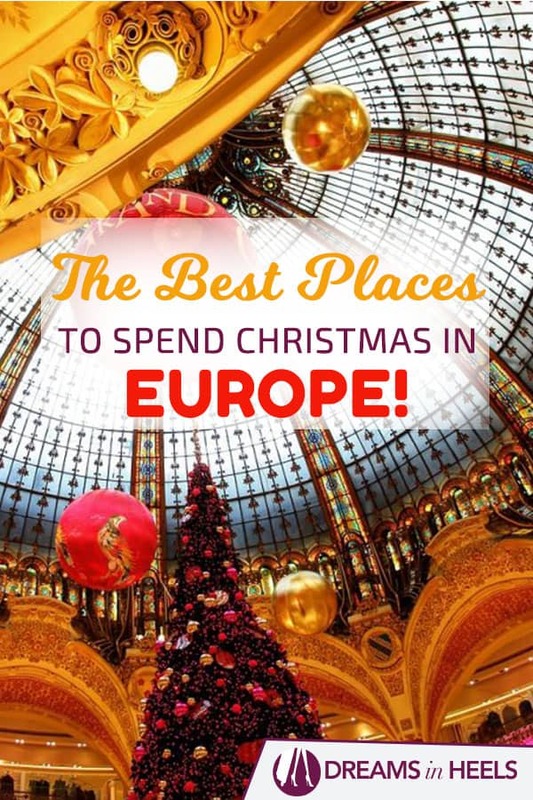 I hope that this list of locations by top travel bloggers gives you some food for thought and inspires you to plan your next Christmas getaway to Europe. 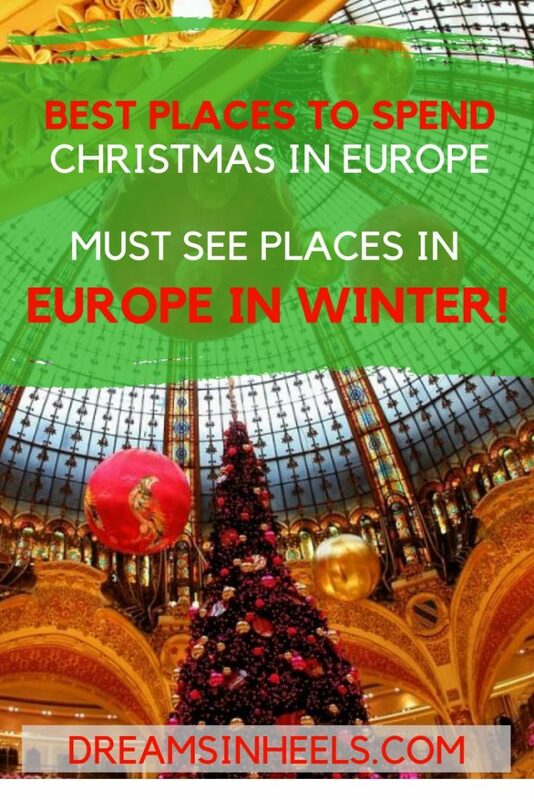 For us, these are some of the best places to spend Christmas in Europe, all must see places, especially during the Winter season. 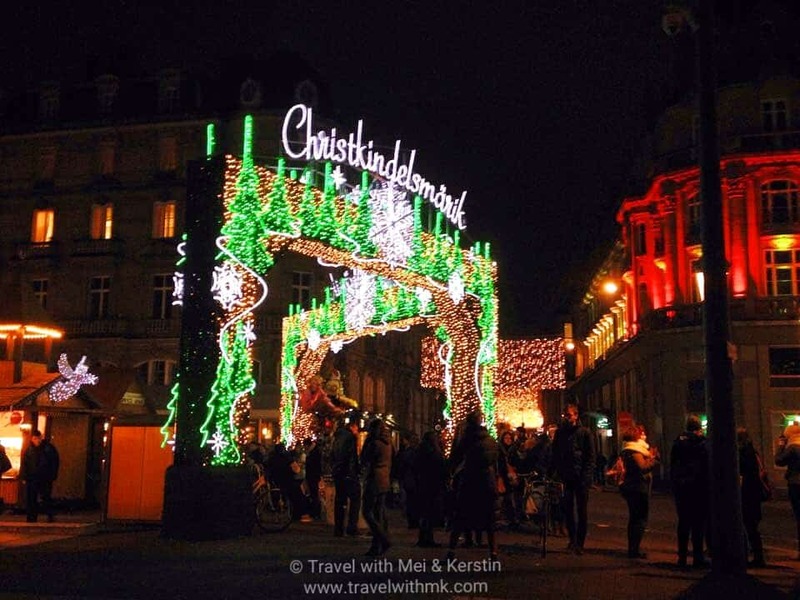 What are your favorite places to celebrate Christmas in Europe? Did we miss your favorite one? Share your experience by commenting below; maybe you’ll inspire our next winter holiday getaway.